Registration is now open. Please see the Registration tab to register online, or to download a printable registration form. We have learned that Jackie Joyner Kersee, who has been a featured clinician for the first 2 years, will be unable to attend this year's camp. In a message that we received from Jackie yesterday, she wrote: "Due to a scheduling conflict, I will not be joining you this year. I wish the campers the very best... JJK." We will miss Jackie this year, but are thankful that we were able to have her work with our campers for the past two years. We would also like to announce that we have added Ashley Trimble to the lineup of clinicians. She was a clinician last year, and did a great job with our campers. Ashley was a standout athlete at the University of Kentucky. She was the 2009 SEC Champion in the pentathlon. She is also a former Assistant Coach at the University of Kentucky. 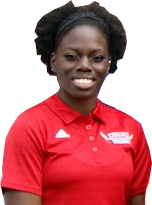 She will take Jackie's place working with our high hurdlers, and will also work with our javelin throwers. We are excited to bring her back this year.